An important technique in HTML5 and CSS3 web development is the use of a tabbed interface in AJAX. 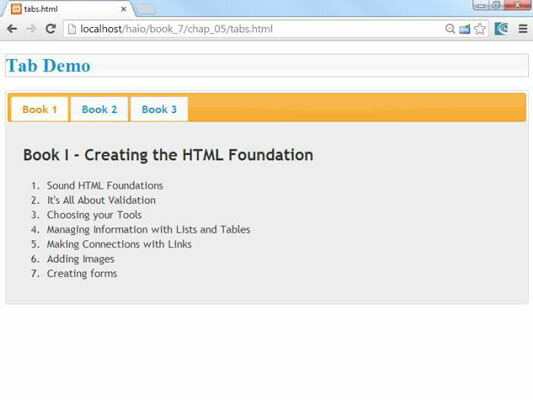 This allows the user to change the contents of a segment by selecting one of a series of tabs. In a tabbed interface, only one element is visible at a time, but the tabs are all visible. The tabbed interface is a little more predictable than the accordion because the tabs (unlike the accordion’s headings) stay in the same place. The tabs change colors to indicate which tab is currently highlighted, and they also change state (normally by changing color) to indicate that they are being hovered over. When you click another tab, the main content area of the widget is replaced with the corresponding content. This is what happens when the user clicks the tab. Add all the appropriate files. Like most jQuery UI effects, you need jQuery, jQuery UI, and a theme CSS file. You also need access to the images directory for the theme’s background graphics. If you’re building a well-organized web page anyway, you’re already pretty close. Build a div that contains all the tabbed data. This is the element that you’ll be doing the jQuery magic on. Place main content areas in named divs. Each piece of content that will be displayed as a page should be placed in a div with a descriptive ID. Each of these divs should be placed in the tab div. Add a list of local links to the content. Build an init() function as usual. Use the normal jQuery techniques. 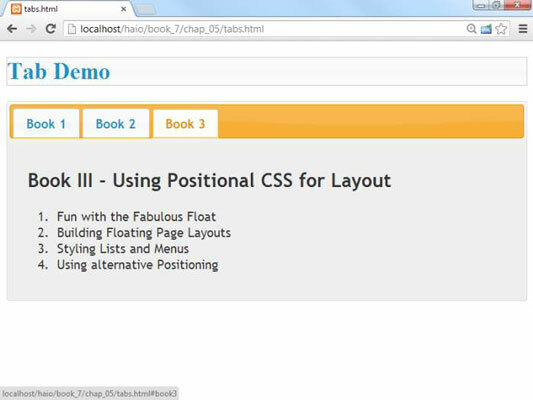 Call the tabs() method on the main div. Incredibly, one line of jQuery code does all the work.